The housing recovery raised selling prices again in January, according to the S&P CoreLogic Case-Shiller home price index. The 12-month price increase among 20 cities was 5.7%, up from the December pace of 5.5%. House prices still grow at more than double the general rate of inflation. A housing economist with Standard & Poor’s said the Federal Reserve’s recent boost in short-term interest rates should not dampen home sales for now, but three or four more increases this year could deter some buyers. March consumer confidence hit its highest level since December 2000, the Conference Board reported. The business research group said that consumers were even more encouraged by current economic conditions and also more optimistic about future prospects. Economists consider consumer confidence a leading indicator of consumer spending, which drives about 70% of economic activity. The National Association of Realtors said its pending home sales index rose 5.5% in February, reaching its second-highest reading since 2006. An economist for the trade group cited a strong job market, higher stock prices, rising interest rates and relatively warm weather for boosting demand. He also suggested a lack of inventory could begin to impinge on affordability. Realtors expect to sell 5.57 million houses in 2017, which would be a 2.3% increase from 2016. The U.S. economy grew more than previously estimated in the fourth quarter, up an annual rate of 2.1%, the Bureau of Economic Analysis reported. That surpassed the earlier 1.9% estimate for the quarter but fell short of the 3.5% gain in the third quarter. The report showed gross domestic product benefiting from even greater consumer spending, which rose at an annual rate of 3.5%. The Fed’s favorite measure of inflation still came in shy of the Fed’s 2% target, which suggests the economy is not growing fast enough to maintain its own momentum.. 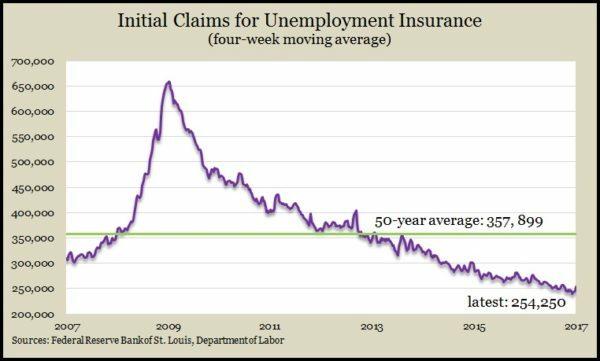 The moving four-week average for initial unemployment claims rose for the fourth week in a row after dipping to 44-year low. According to data from the Labor Department, jobless applications have been below the all-time average every week since early 2013, indicating that employers are cautious about letting workers go. That helps support a stronger hiring market. The Bureau of Economic Analysis said personal spending was even softer in February than it was in January, rising 0.1% down from 0.2%, in part because of weaker consumption of services. Personal income rose o.4% in February, boosted by higher wages and salaries, which increased the personal saving rate rose to 5.6% of disposable income, the highest since October. 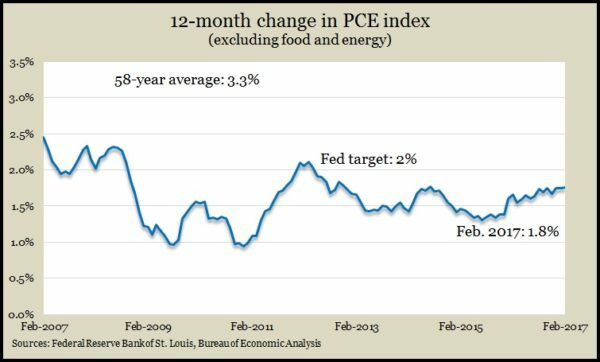 In the same report, the Federal Reserve’s favorite measure of inflation showed a 1.8% year-to-year increase, the same as January. The Fed’s target rate of 2% hasn’t been met in nearly five years. In another indication that greater consumer spending may be on the horizon, the University of Michigan consumer sentiment index rose in March. A Michigan economist noted a continued divergence between the relative optimism of Republicans and pessimism of Democrats in the survey, which mixes overall rising confidence with greater uncertainty. He expects partisan differences in the survey to fade over time and forecasts a 2.7% growth rate in consumer spending in 2017.